Wild-caught Alaska Pollock in a southern-spiced crunchy corn coating. Real fish, real ingredients, real good. 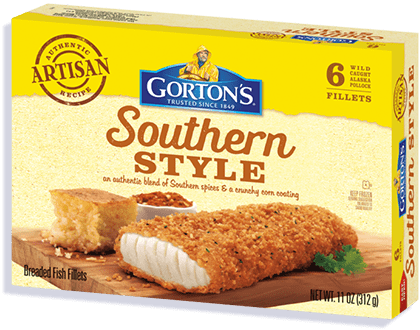 Our Southern Style Artisan Fillets feature a savory blend of southern-inspired spices and a crunchy corn coating. And at only 170 calories per fillet, down-home cooking is healthier than ever. UNCOOKED. KEEP FROZEN UNTIL READY TO COOK. For food safety and quality, follow cooking directions below. 4. Bake uncovered 17–19 minutes* until coating is golden brown and crunchy. Turn fillets over after 12 minutes of cooking. *FULLY COOK FISH TO AN INTERNAL TEMPERATURE OF 165°F OR HIGHER BEFORE SERVING. ALASKA POLLOCK, WHEAT FLOUR, VEGETABLE OIL (COTTONSEED AND/OR SOYBEAN), WATER, ENRICHED BLEACHED WHEAT FLOUR (FLOUR, NIACIN, IRON, THIAMIN MONONITRATE, RIBOFLAVIN, FOLIC ACID), LESS THAN 2% OF: MODIFIED CORN STARCH, SALT, YELLOW CORN FLOUR, SUGAR, YELLOW CORN MEAL, SPICES, DEXTROSE, DEHYDRATED GARLIC, WHEY, BAKING POWDER (BAKING SODA, SODIUM ALUMINUM PHOSPHATE), YEAST, MALTODEXTRIN, HYDROXYPROPYL METHYLCELLULOSE, PARSLEY, COLORED WITH PAPRIKA, ANNATTO, AND TURMERIC EXTRACTS, NATURAL FLAVOR, MALIC ACID, SODIUM TRIPOLYPHOSPHATE (TO RETAIN FISH MOISTURE), TBHQ (TO PROTECT FLAVOR). Not a significant source of vitamin A and vitamin C.
80mg of EPA and DHA Omega-3 fatty acids per serving.